Speaking in general terms, my personal drift away from Latin- or South American rums over the last few years derives from the feeling that they’re a little too laid back, and lack pizzazz. They’re not bad, just placid and easy going and gentle, and when you add to that the disclosure issues, you can perhaps understand why I’ve moved on to more interesting profiles. Far too many producers from the region do too much unadventurous blending (Canalero), don’t actually have a true solera in play (Dictador), have a thing for light column still products which may or may not be tarted up (Panama Red), and are resting on the laurels of old houses and family recipes (Maya) whose provenance can hardly be established beyond a shadow of doubt (Mombacho or Hechicera). Moreover, there is too often a puzzling lack of easily-available background regarding such rums (more than just marketing materials) which is out of step with the times. Still, I have to be careful to not paint with too wide a brush – there are many good rums from the region and I’m not displeased with all of them. In a curious turnabout, my favourites are not always released by from or by Latin American companies — at least, not directly — but by independents who take the original distillate from a broker and then release it as is. This avoids some of the pitfalls of indeterminate blending, additives, dilution and source, because you can pretty much count on a small indie outfit to tell you everything they themselves know about what they stuffed into their bottle. 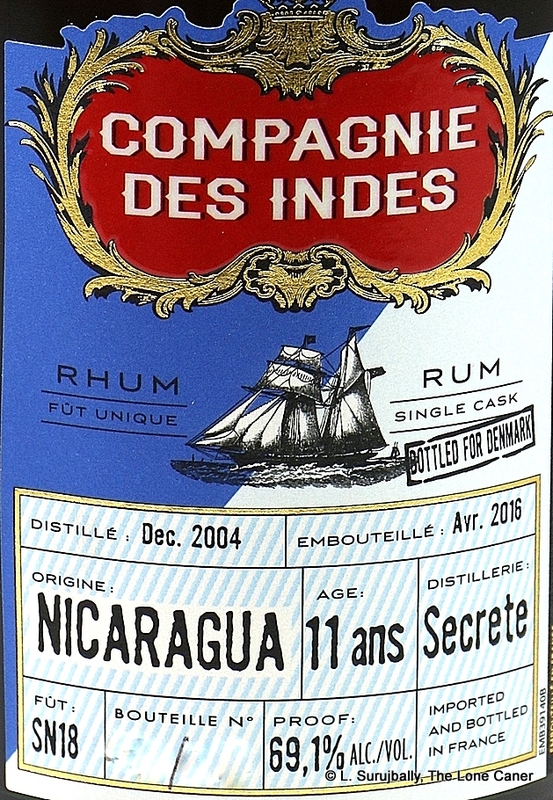 That’s not to say that in this case the Compagnie is a poster child for such disclosure – the distillery on this one is noted as being “Secret”, for example. But I suspect that Florent was a bit tongue in cheek here, since any reasonably knowledgeable anorak can surmise that the 11 YO rum being reviewed here is a Flor de Cana distillate, column still, and aged in Europe. 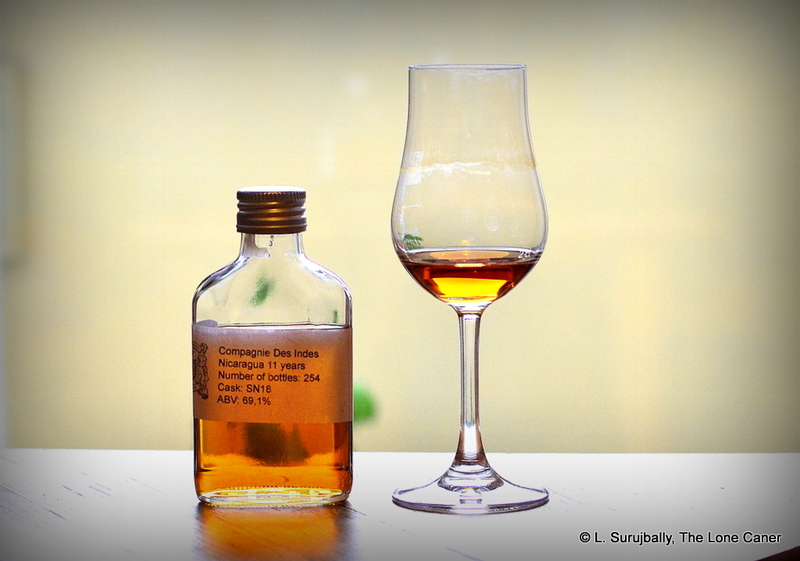 Compared to the Mombacho 1989 that was being tried alongside it (and about which I still know too little), the nose was much more interesting – perhaps this was because the Compagnie didn’t mess around with a soft 43%, but went full bore at 69.1% for their favoured clients, the Danes (this rum is for the Danish market). Yet for all the strength, it presented as almost delicate — light, fruity (pears, guavas, watermelon., papaya), with a nice citrus tang running through it. When it opened up some more, I also smelled apples, pears, honey, cherries in syrup, and a pleasant deeper scent of aromatic tobacco, oak and smoke, and a touch of vanilla at the back end. The palate was also very robust (to say the least). It was sharp, but not raw – some of the rougher edges had been toned down somewhat – and gave off rich tastes of honey, stewed apples, more sweet tobacco and smoke, all of it dripping with vanilla. Those light fruits evident on the nose were somewhat overpowered by the strength, yet one could still pick out some cherries and peaches and apples, leading into a very long and highly enjoyable finish with closing notes of gherkins, brine, cereals, vanilla, and a last flirt of light sweet fruits. Perhaps it was a mistake to try that supposed 19 YO Mombacho together with this independent offering from France. On the face of it they’re similar, both from Nicaragua and both aged a fair bit — but it’s in the details (and the sampling) that the differences snap more clearly into focus, and show how the independents deserve, and are given, quite a bit more trust than some low-key company which is long on hyperbole and short on actual facts. As noted above, neither company says from which distillery its rums hail, though of course I’m sure they’re Flor de Cana products, both of them. We don’t know where Mombacho ages its barrels; CDI can safely be assumed to be Europe. The CDI is stronger, is more intense and simply tastes better, versus the much softer and easier (therefore relatively unchallenging) Mombacho, even if it lacks the latter’s finish in armagnac casks. Beyond that, we get rather more from the Compagnie – barrel number, date of distillation and bottling, true age, plus a little extra – the faith, built up over many years of limited bottlings, that we’re getting what they tell us we are, and the confidence that it’s true. That alone allowed me to relax and enjoy the rum much more than might otherwise have been the case. Controls this time around were the aforementioned Mombacho, the Black Adder 12YO, and another Nicaraguan from CDI, aged for seventeen years. I dipped in and out of the sample cabinet for the comparators mentioned in the first paragraph — not to re-evaluate them, just to get a sense of their profiles as opposed to this one. We should not read too much into the “Secret” appellation for the rum’s source. Sometimes, companies have a clause in their bulk rum sales contracts that forbids a third party re-bottler (i.e., an independent) from mentioning the distillery of origin.